On this page, you’ll find all you need to know about my comics work in the areas of fiction and non-fiction. [Yonge at Heart] “1001 Torontonian Nights” is a short story in the Toronto Comics: Yonge at Heart Anthology which was illustrated by Gina Basora. 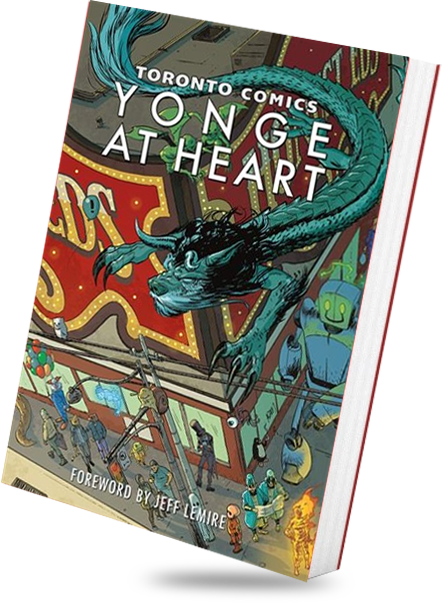 Yonge at Heart is available on the Indigo Chapters website or directly from the Toronto Comics website. It is also available in comic stores throughout Toronto. [Called Into Being: A Celebration of Frankenstein] I am contributing a visual essay to the upcoming Called Into Being: A Celebration of Frankenstein zine which marks the 200th anniversary of Frankenstein. My essay will be illustrated by Kelly Guillory. For more information on Called Into Being, please check their Tumblr page.